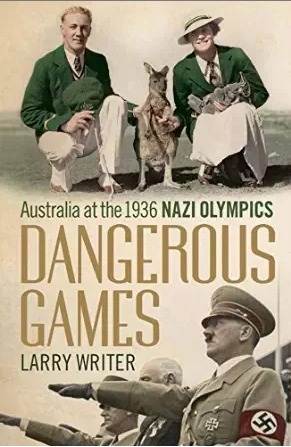 Dangerous Games, Australia at the 1936 Nazi Olympics, might seem like an odd reading choice for someone uninterested in sport, but there it was at the library and it turned out to be quite an engrossing read. the story of a bunch of naïve Australian hopefuls competing on the world stage when their amateurism was no longer good enough. It was a different sporting world back then, starting with the sporting culture. Athletes took long rests between meets, and one rower smoked a pipe and rolled his own cigars. One swimmer’s mother held a press conference after her daughter was featured in a Women’s Weekly photo shoot to reassure reporters that success hadn’t gone to her head. Sent to Berlin early to allow the team to get used to cinder tracks and metric measurements, athletes who claimed to have trained as hard as they could partied long and hard, some of them deploring the intensity with which other teams trained. The team’s preparation was a debacle. There weren’t any (metric) Olympic sized pools in Australia so in Berlin swimmers had to re-learn how to judge their turns. There weren’t freshwater training pools either; the Aussies were used to swimming in saltwater with a different level of buoyancy. Running on cinder tracks instead of grass caused all kinds of injuries, and they didn’t even have the right kind of running shoes. It didn’t occur to anybody to tell the Aussie wrestlers that international rules were different to the rules under which they competed in Australia. But perhaps worst of all there was no possibility of serious training during the 5-week voyage and they arrived in Berlin unfit and overweight to start with. (If you’ve ever tried to swim in the pool of an ocean liner, you’ll know just how difficult it is just to judge the way the water level shifts from one side of the pool to another). Although the improbably-named Writer makes no mention of it, there must have been plenty of other countries competing out of their depth against countries paying only lip-service to the Olympic ideals of amateur sport, but Australia was not only amateur in every respect, from selection processes to training facilities to administration, it was also naively overconfident, believing in the myth of natural ability. It had performed reasonably creditably at the most recent Olympics, but had no idea that the sporting world had changed. By the time the next Olympics rolled around in 1948 in London, they knew better… (There had been, of course, the usual post-mortems about team performance). Reading this book made me wonder how these athletes subsequently felt about competing at these Olympic Games forever tainted by Nazism. Although in retrospect it seems clear that the world community should have stood up to Hitler and cancelled the Games, it seems a bit sad that the highlight of a sporting career should have these connotations. According to the author, there were some who still felt that sport should be above politics, others who couldn’t help but notice the militarism (not to mention the aerial war games that were on display in the night sky) but hoped for peace anyway, and others who didn’t like to talk about it. And some really were far too young to have any idea about what was going on. The only serious prospect of a boycott was led by America, with public opinion evenly divided. There were powerful voices urging a boycott because the US State Office knew exactly what was going on in Germany, but that fizzled out when Avery Brundage, president of the American Olympic Committee was personally invited by Hitler to see the preparations. He was charmed by everything he saw, and that was the end of that. Perhaps if America had led a boycott, things might have been different, but the UK was too busy appeasing Hitler, and Australia was too sport-obsessed to contemplate it. Everyone knows that the Berlin Olympics were a propaganda triumph, but Writer sketches in significant detail just how sophisticated the propaganda machine was. Today we are used to spin merchants peddling all sorts of lies and you don’t have to be particularly astute to recognise it, but Goebbels was masterful in his choreography of events. Dangerous Games is worth reading for this aspect of events on its own. So, Dangerous Games is not just a book for people interested in sport! These books are interesting to me because although I’m not interested in the sport at all – I do enjoy reading about the Hitler hubris – like In the Garden of the Beasts (Eric Larson) which details the life of a US ambassador’s daughter in those days. Fine book. Oh – yes, I think the Australian team was mentioned in Boys in the Boat. But everyone was partying quite a lot – some scandals about it. These class issues seem to have arisen here too. Some of the men, notably the rowers, came from prestigious grammar schools, while others had had very little education and had led knockabout lives. In interviews long after the event it came out that there was some friction between them. But LOL bad behaviour, called larrikinism here, seems to have been a feature regardless of their background. It’s the management of the propaganda tat I find not just interesting, but also instructive. In a sporty nation like ours, big events like the Olympics, the Commonwealth Games etc are always a good distraction from political issues that the government would like brushed under the carpet. I heard Larry Writer interviewed by Richard Fidler. Richard Fidler is such a good interviewer that I feel as if I have read the books that he discusses with the author- probably not good for book sales! I heard that podcast too. It’s a very good summary of the book from the sounds of it. Yes, I enjoy Richard Fidler too, and also Michael Cathcart – he’s not afraid to tackle more challenging books, which I like. WE are so lucky to have our Aunty ABC. I’ve just listened to it today, and I think the interviewer was rather naïve. It doesn’t seem to have occurred to either of them that the reason that Jewish competitor didn’t give the real reason for pulling out at the time might have been that he didn’t want to be subjected to anti-Semitism here. Plenty of people didn’t reveal Jewish ancestry here because there was so much discrimination, legal and otherwise.